Theo Hansel, a chemistry major at Harvey Mudd College, has won the 2018–2019 American Association for Cancer Research (AACR) Undergraduate Scholar Award. Hansel is one of 10 college students chosen from the U.S., Canada and Puerto Rico to win the award. 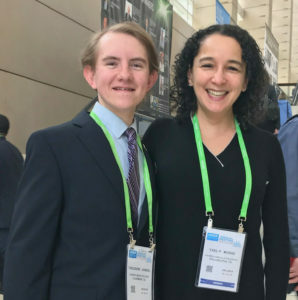 He receives complimentary registration and a $1,500 stipend each year to support his participation this year and next in AACR Annual Meetings, one of the largest conferences for cancer researchers. The remainder of the award can be used for related school projects or science events. Established by AACR member Thomas J. Bardos, the award for full-time, third-year undergraduate students majoring in science aims to inspire science students to enter the field of cancer research. Hansel’s interest in the field is personal: He was diagnosed with cancer at age 3. Hansel has been focused on this goal since high school when he began working in the research lab of Dr. Yael Mossé, one of his doctors. “She really inspired my passion for research and love of science and my desire to really train myself as a scientist, in addition to wanting to become a doctor,” he says. At Harvey Mudd, he’s done research on campus with chemistry professor Mary Van Vleet ’12, learning the fundamental physics of intermolecular interactions and the tools of scientific computing and molecular modeling. During summers at the University of California San Francisco, he’s tested different treatments for neuroblastoma with Dr. Clay Gustafson and studied “cancer more generally” with Dr. William A. Weiss. He’ll return to Gustafson’s lab this summer on a grant from the St. Baldrick’s Foundation. In addition to his scholarly activities, Hansel is a student leader on campus. He’s a Drinkward Residence Hall mentor and proctor, a member of the Honor Code Committee, a tenor in the Claremont Chamber choir and membership vice president of Science Bus. Hansel received the HMC chemistry department’s William G. Sly Prize, which honors a junior chemist who exemplifies curiosity, intellectual integrity and enthusiasm. Founded in 1907, the American Association for Cancer Research is dedicated to promoting the education and training of the next generation of able and dedicated scientists and to facilitating and nurturing their careers in cancer research and cancer-related biomedical science. Posted in: Award, Chemistry, Experiential Learning, Students.